The shot-blasted FC5 makes its presence known in the HTPC market with its low profile look, fanless cooling and 100% aluminium construction! 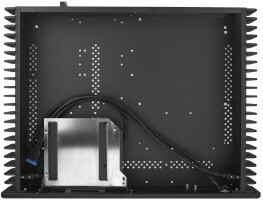 Looking for a new HTPC case? You just might have found it! PLEASE NOTE: The only difference between the FC5OD and the FC5WS chassis is that the FC5OD has a slot for a slot-loading optical drive, where the FC5WS does not. The new FC5 ALPHA follows in its predecessors footsteps with the same minimalist styling, the updated version brings even more refinement to this timeless sleek design. At the heart of these improvements is the updated bottom panel which is not only more robust but has been redesigned to optimise airflow, reducing internal temperatures. Motherboard size and drive storage options also benefit from this new design, with the FC5 Alpha now accommodating an additional 2 x 2.5" drives and a full size motherboard. A single USB3 port is now located on both sides of the case for easier access and balance. Many home theatre chassis are finished with the brushed aluminium effect, but the FC5 is not like other home theatre chassis. Streacom have finished the FC5 in a very fine shot-blasted finish which gives an elegant pitted look to the aluminium rather than a lined look which brushing produces. It is all down to personal preference as to which looks better but one advantage that a shot blasted finish has over a brushed finish is that it does not leave visible fingerprints behind as brushed aluminium finishes often does. Motherboard and CPU - The FC5 ALPHA is compatible with Mini-ITX, Micro-ATX and ATX motherboards. 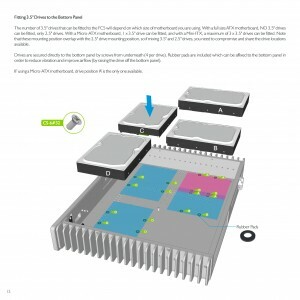 Depending which motherboard you opt for will determine how many HDD/SSDs can be installed (more info on this below) and which CPU to use. The case is capable of cooling virtually all CPUs that have a TDP of 95W or lower. 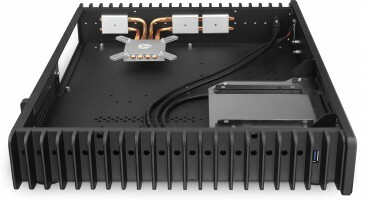 Alternatively, Streacom now has available a 240W Internal fanless PSU, the ST-ZF240. 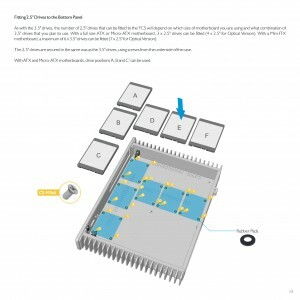 That extra 90W (compared to the Nano-PSU) will allow for even more drives to be connected to the system or you may want to opt for a CPU that has a maximum TDP of 95W for greater performance. The ZF240 works best when installed into the FC5 chassis. Optical Drive - The FC5 uses a new universal eject mechanism so it will work with any slot loading laptop drive regardless of where the eject button is located on the front of the drive. Streacom have already sourced the perfect drives for these cases, take a look at the available drives here. Obviously the FC5WS does not support an optical drive. 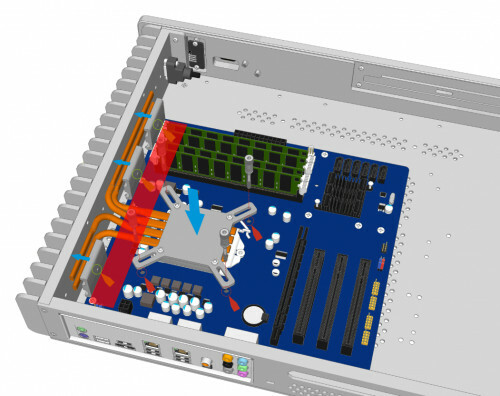 SSD/Hard Disk Drives - The FC5 cases can house many drive combinations depending on which size motherboard is fitted or which PSU is used. The instructions from Streacom's website go through in detail the options that are available. It is highly recommend that you take a look at the images below, or alternative feel free to look at the instructions. Drive Capacity Minimum 1x 3.5" + 2x 2.5", Maximum 3x 3.5" or 6x 2.5"